Most of us are familiar with the term audit. Typically, audit is considered to be associated with financial matters such as accounts, costing, taxation etc. As a result, the very mention of audit evokes fear, not comfort. However, management system audits are totally different in nature, whether on Quality Management Systems (ISO9001:2015) or Environment Management Systems (ISO14001:2015) or similar management systems. The objectives of a management system audit are: checking the adequacy of system viz-a-viz requirements stated in ISO9001:2015 / ISO14001:2015 / ISO45001:2018 / SA8000:2014, etc., checking the compliance with requirements, and identifying the opportunities for improvement. Also, the ISO9001 / ISO14001 / ISO45001 / SA8000 certified organizations have to train a group of employees (called internal auditors) who would carry out internal audits at regular intervals. At the individual level, management system audit is a professionally fulfilling activity which can be undertaken as an internal auditor / as a full-time auditor working for a certifying agency. However, ISO has clearly indicated that an auditor needs to be qualified and he / she must follow the 'Principles of Auditing'. 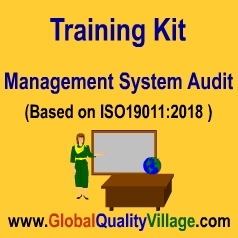 The ISO has even published a standard (ISO19011:2018) to provide guidance on how to select / evaluate auditors and how to conduct management system audits. You will be amazed to find that an effective audit is much more than just ticking some checklists ! To learn learn how to evaluate the competence of auditors. Observing the confidentiality of audit findings. Price of CD-ROM version is inclusive of shipping charges. Product CD shall reach you within 7 days (India) or within 20 days (other countries) of receiving the payment. Copyright � 2019 Sirwill Software Private Limited, India. All rights reserved.